I know many of you are waiting for it but there is no Savage Space post today. Sadly I could not get as much done as I would have liked. Damn Work! But work is not the only culprit. My players asked me to set up a second group so we have a go-to game on days where not all players can make it. They wanted something fantasy with magic and monsters to have something different from our regular modern horror game. My chance to run a Setting I really like : Totems of the Dead. I also always wanted to do a hexcrawl. And have a Viking campaign. These parts fit together really well. I will run the game in the Totems setting but with a few tweaks. For example I disliked the implication that all the different cultures would be in semi regular contact with each other. Instead I want to play it as the Skadians having just arrived a few generations ago. There are some already established settlements and cities but nothing bigger then a few thousand people. There has been contact with some of the natives but so far no real understanding between the cultures. Part of the area is already discovered and mapped but much is still unknown and left to be uncovered. The Players will be part of a clan that crosses the ocean to follow the call to the new world from an influential Jarl. He is a descendant from a bloodline the players clan has been loyal to for generations. The Jarl has just established a Fort in the far reaches of the north. The players are part of the last group of the family to arrive due to severe storms that delayed them for a long time. When they arrive at the Jarls Stronghold most of the family has already left again to build the village where they all will live. To kick things off I will use the “Out of Ale” scenario. Afterwards they will head out to their Village where the hexcrawl will begin. 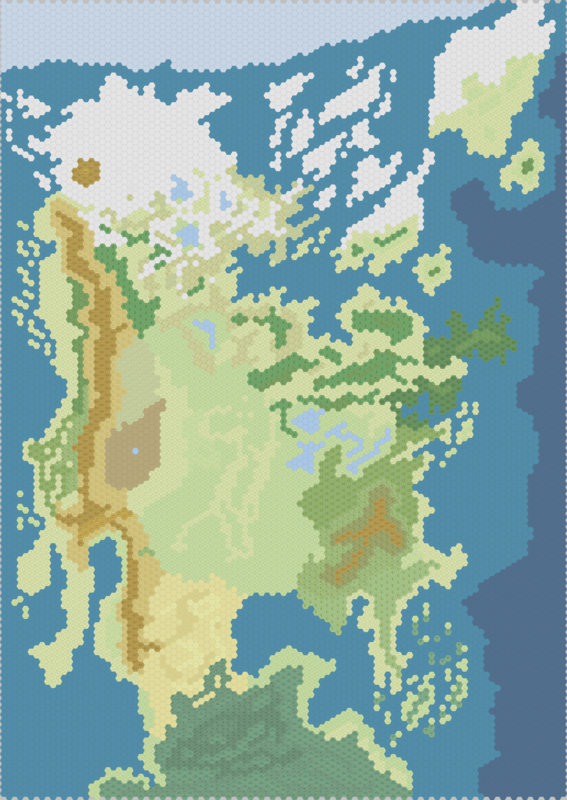 I am in the middle of my preparations and so far I have recreated the Untamed Lands as a hexmap (see above) and then drilled down to the Skadian Lands (right) and created these as the Adventures will take place mostly in that area. I have also prepared a set of custom Icons (below) for use in Hexographer with a more “Viking” look fitting for the Skadians. 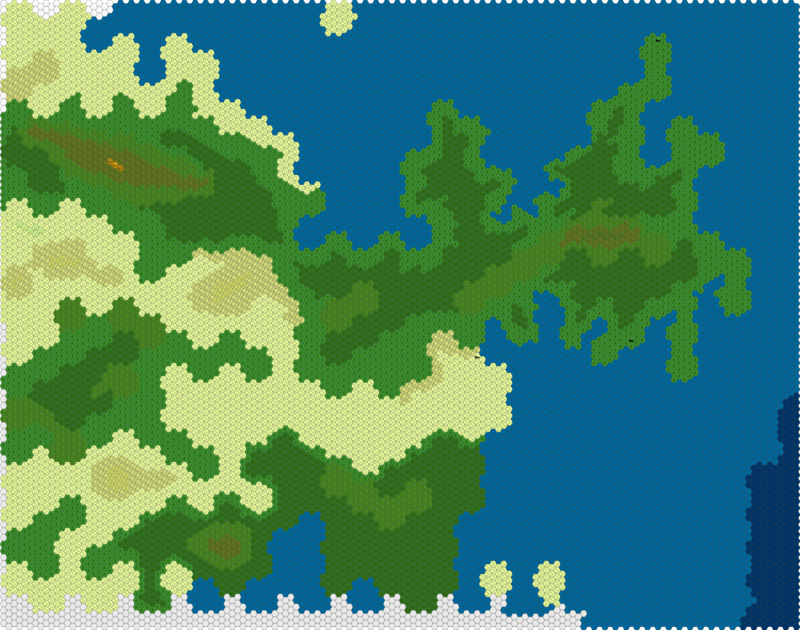 There is still some work needed on the hexmaps as I am not totally happy with them yet but overall they will be workable. Now the real fun starts. No hexcrawl without encounter tables and randomly determined adventure locations. The Welsh Piper Website has been a great inspiration and help in getting started, especially his articles about Hex Based Campaign Design and Encounter Tables. The latter is a still ongoing series and has already helped me in setting up some mock tables I will have to refine a bit. As you may know I am a huge fan of card based generation. I used that in the Adventure Generator in Savage Space. Everything I find so far are examples of dice tables though. I wager this is simply because you can better set up encounters with dice as you can better influence rarity of encounters. With cards the probability curve is totally different. Not sure how this will work out. When I have something finished I will post again here. Does anyone of you have experience with hexcrawls using Savage Worlds or any other system? I would love your comments or advice! Read you soon. Hey Chaosmeister, I really like the icons you created – very cool and definitely Viking flavoured. I’m interested in your Untamed Lands map, too – it looks vaguely familiar 😉 – what’s the scale? I shrunk the map scale down a bit from the original scale to make it more accessible for my players. One Hex is one atlas hex or 25 miles. Your maps look cool. I hadn’t read too much about Totems of the Dead before reading your post. I read through some of your older posts about it and I’m looking forward to checking the setting out. On a side note, your evolved humans for Savage Space look great too! Hey, If I can get one single person to check out Totems I feel I have done my work! It is a cool setting and deserves much more praise then it has gotten. The release close to the date Beasts&Barbarians was published didn`t help I think. I like it tremendously but as I participated in the playtest I feel too biased to write a proper review about it. Glad you like the Savage Space material, there is much more to come I can not talk about yet. I started reading through the players guide last night. I know what you mean reference the release date. It’s easy for great products to get overshadowed. I have actually owned Beasts and Barbarians for awhile now and hadn’t heard of Totems of the Dead. It probably didn’t help that it’s split into 2 books that were released separately but there is so much material it would have likely been impossible to release them as a single volume. I’m impressed with it so far. The setting, layout and artwork are fantastic. I wish the pdf’s were more tablet friendly like a lot of the Reality Blurs books but that’s a minor thing. Both the Player’s and GM’s books are part of Rpgnow’s GM sale right now so it’s a great time to get them. Yes, they are really gorgeous books, the artwork is simply outstanding. Glad you like it! The setting has so much detail, it is hard to digest it all. The GM guide with its bestiary is also absolutely amazing. While creating encounter tables I realized how different the enemies for my players will be, no more Orks or similar. There are only very few known creatures in there. That should keep my players on their toes! I just got Totems; it’s fantastic. Sean Patrick Fannon has a very cool card-based adventure generator called “MACS.” There is a version of it in Shaintar, but he sent me a generic version when I asked him to.